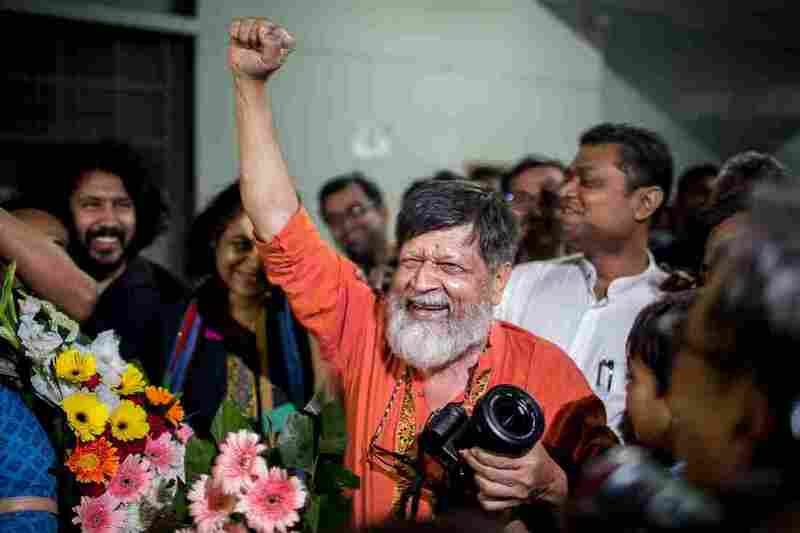 Bangladeshi Photojournalist And Activist Freed After 107 Days In Prison Shahidul Alam was imprisoned on charges of "spreading propaganda" for publicly criticizing the government's violent response to street protests. Bangladeshi photographer and activist Shahidul Alam, center, reacts as he is released from Dhaka Central Jail, Keraniganj, near Dhaka on Tuesday. A few days after Alam was granted bail by Bangladesh's High Court, he reportedly walked out of jail around 8:20 p.m. local time, after a "daylong confusion" involving authorities saying Alam's address did not match the one listed on jail documents, according to The Daily Star. The 63-year-old was arrested on Aug. 5 and charged with "spreading propaganda and false information against the government" after he publicly criticized Prime Minister Sheikh Hasina's government for its violent response to student protests that began over road safety. In an Al Jazeera TV interview prior to his arrest, Alam said the protests stemmed from a long-simmering anger over the government and a "never-ending list" of grievances, including gagging the media, extrajudicial killings and widespread corruption. He also said that Hasina had "no credibility" and that the current government would lose if free and fair elections were held. Anger over his arrest sparked international calls to "Free Shahidul" — including from Archbishop Desmond Tutu, the Committee to Protect Journalists and U.N. human rights experts. 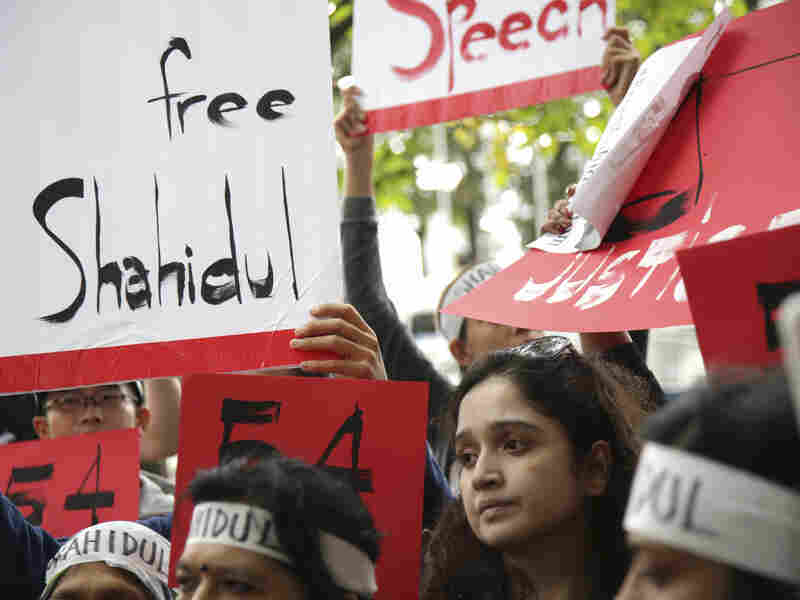 A group of people rally in support of Alam on his 54th day in prison outside United Nations headquarters in New York City on Sept. 27. 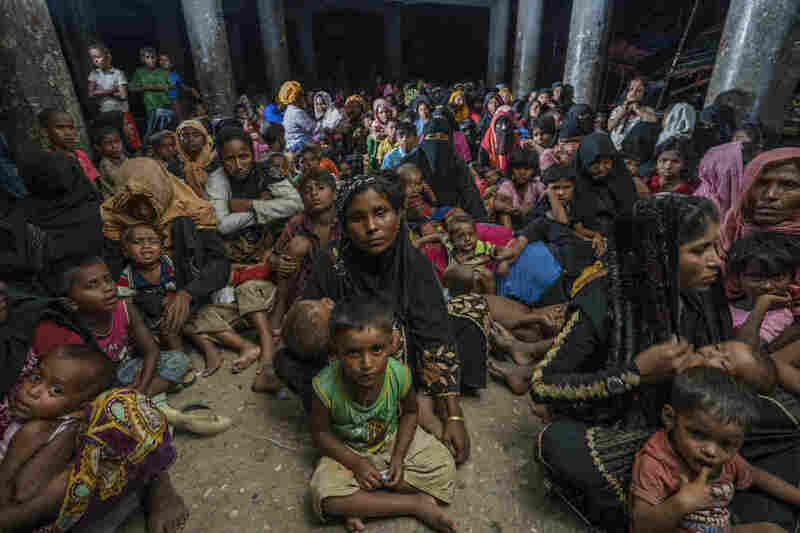 NPR's Emma Bowman wrote shortly after Alam's arrest, "In a career spanning more than three decades, he has chronicled his country's tumultuous history, photographing natural disasters, political upheaval, human rights abuses and, recently, the conditions facing Rohingya refugees who fled to Bangladesh from Myanmar. He has also covered stories elsewhere in the region, including places rarely visited by journalists, such as the Maldives." "A lot of the work that I do makes me unpopular with my government," the photographer told NPR in 2011. Alam also served as a mentor to photographers and photojournalists through the Drik photo agency, a Dhaka-based school of photography he founded in 1989. Alam, a former chemist, became a photojournalist after growing weary of seeing developing countries through the lens of Western photographers. "Photographs have that ability to engage with people at a powerful level," he told NPR.